" Angkor is the name of the ancient city where the groups of temples were built, Angkor Wat is the name of a grestest temple in Angkor. " 3. A BIT OF INFO ABOUT THE TEMPLES! Angkor translates to mean 'Capital City' or 'Holy City'. The ruins of this holy city are the remnants of the Angkorian capitals and represent the pinnacle of the ancient Khmer architecture, art and civilization. 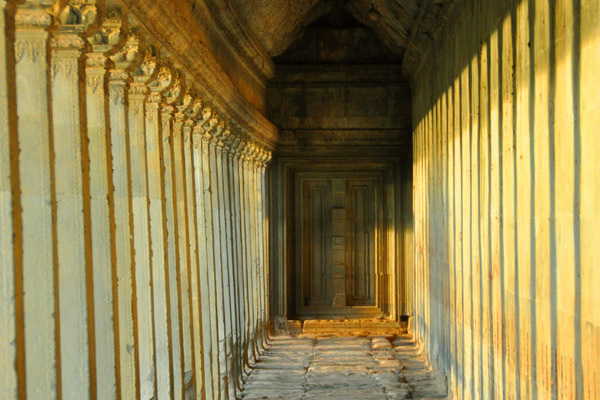 Many Khmer kings built the amazing temples, defense walls and reservoirs. The Angkor period began with the rule of King Jayavarman II who was responsible for a vast number of the monuments and temples. He built many temples for himself, his mother and father. King Indravarman I was responsible for building the 650 hectares of reservoirs. This was a massive irrigation system that provides water to most of the Angkor Wat areas. It was because of this reservoir that Angkor Watt could sustain and support its large population. Here is a bit of a summary about some of the major temples that are a must to see when you go to Siem Reap. However, please note there are heaps more and this is just a quick summary. The world largest religious monument A completely realized microcosm of the Hindu universe, Culminating in the five peaks of Mount Meru Architectural masterpiece in fine proportions and rich in detail; The apogee of classical Khmer construction some 600 m of narrative bas relief and nearly 2,000 Apsaras. The outer limits of Angkor Wat are set by its broad moat,faced in laterite and sandstone. Including this , the total area is almost 200 hectares-a retangle of 1.5 km E-W by 1.3km N-S, the largest temple at Angkor. Two causeways at W and E cross the 190m-wide moat to outer enclosure, bounded by a laterite wall of 1025m by 802m. Because of Angkor Wat's unusual orientation, the W gopura of this outer enclosure is by far the largest of four. Within the 82 hectares of the outer enclosure, the temple itself stands in the middle on a terrace measuring 332+258, nearly 9 hectares. The remaining 9/10 thus of the area was taken up with the city, including the royal palace, although of course no trace remains of these Buildings, presumably constructed in light materials. One of the major temples of Jayavarman VII -in fact, a temple-monastery-Ta Prohm features a set of concentric galleries with corner towers and gopuras, but with many other additional buildings and enclosures. The complex city of its lay out is increased by its partly collapsed state, with trees interlaced among the ruins. According to its steel, which until recently was In situ, the principle divinities of Ta Prohm were installed 1186 to transfer merit the king's mother the principle deity, prajnaparamita, the (perfection of wisdom) was carved in her likeness (similarly, the Principe deity of Preah Khan, Lokesvara, was carved in the likeness of - The king's father). This was only five years after Jayavarman's accession, making it clear that much of the building work took place throughout and after his reign. There are two species: the larger is the silk cotton tree (Ceiba pentadra) distinguished by its thick, pale brown roots with a knobby texture, the smaller is the strangler fig (ficus gibbosa), with a greater mass of thinner, smother grey roots. In both cases, the plant takes hold in a crevice somewhere in the superstructure of a building, usually where a bird had deposited the seed, and extends roots downwards to the soil. In doing this, the root work their way between the nonstories, so that as they grow thicker, they gradually wedge open the blocks. This, the State Temple of Jayavarman VII and his immediate successors, is one of the most enigmatic and powerful religious constructions in the world. The temple is extremely complex both in terms of its structure and meaning, having passed through different religious phases from Pantheon of the Gods, Hindu worship and Buddhism. It uses, uniquely, a mass of face-towers to create a stone mountain of ascending peaks. There is some dispute about the number of towers. The Bayon has gone through several architectural changes, with additions that are responsible for the complexity and crowding at its centre. This is because the city of Angkor Thom was so well fortified that later kings found it simpler to re-model the Bayon rather than remove it and build their own new State Temple which would have had to have been in the same place at the centre of the city. Its plan is distinctive and has many peculiarities. The temple itself is composed of two galleried enclosures, which are almost square, but also on three levels, because of the rebuilding described below. The approach, which is probably later, is a broad, two-tiered terrace, 72m long and guarded by lions, leading to the eastern gopura of the outer enclosure, which measures 156m x 141m. This is the first, at ground level and is surrounded by a gallery with corner pavilions and gopuras. Within this, the inner enclosure is 80m x 70m, and is slightly offset, in common with most Khmer temples, away from the entrance. Between the 3rd and 2nd enclosure, can be clearly seen traces of 16 large chapels where Buddhist and local divinities were housed. They were demolished by Jayavarman VIII. The confusion of the Bayon begins inside the inner enclosure, where additional construction has made a complex arrangement of galleries and towers on the second level. Within the almost-square surround of galleries, another set of redented galleries in each corner enclose a cross shape. It is generally agreed that the original gallery was cross-shaped, and that the corners that make it now rectangular were added later. Almost filling the cross-shaped gallery walls is the 3rd level – the upper terrace, also later – and in the centre of this rises the central massif, which is, very unusually, round. 25m in diameter, it reaches a height of 43m above ground-level, and is connected to a series of small chambers to the east. In fact, it was originally cruciform in plan, but later radiating chapels filled in the ‘circle’. Dominating the whole arrangement of galleries and terraces are the face-towers, some over the gopuras, others over the corner angles, yet others free-standing on the upper terrace. As mentioned above the numbers of faces are in dispute. Equally, the actual numbers of towers do not have any symbolic significance as many were added later. Their different individual heights combined with the different levels of the temple create the impression of a forest of towers rising towards the centre. One of Jayavarman VII’s largest projects, Preah Khan was much more than a temple: with over 1,000 teachers it appears also to have been a Buddhist university, as well as a considerable city. As at Ta Prohm, the foundation stele was discovered in situ, and it gives a considerable amount of information about the temple, its foundation and its maintenance. Preah Khan is located on the western edge of its own long baray, the Jayatataka, and a terraced landing-stage at the end of the temple’s W-E axis gave access to the lake. A moat encloses the city, which covers 800m x 700m – 56 hectares. Within the outer wall, most of the space was occupied by the city dwellings. The third enclosure, 200m x 175m, is bounded by another laterite wall, with four gopuras, of which the eastern one is the grandest. Inside, much of the space between the wall and the second enclosure is taken up with additional structures and ponds, including a Hall of Dancers on the E side, subsidiary galleried enclosures on the N, W and S, and ponds of different sizes in each of the four corners. This unusual small monument (pronounced ‘Neak Pouan’), a cruciform arrangement of ponds with a sanctuary tower on a circular island in the middle, is pure symbolism. Set in the middle of the Jayatataka baray on what was formerly an island, it may represent the sacred Himalayan lake of Anavatapta. This lake was famous for its miraculous healing properties and as the source of four great rivers issuing through the mouths of a lion, an elephant, a horse and an ox. However, this Buddhist symbolism only came later, during a period of rebuilding, and it was originally a royal Hindu site; the stele of Preah Khan gives its name as Rajyasri – ‘the Fortune of the Kingdom. Like West Baray and East Baray, each with their Mebon, the baray of Preah Khan was also designed with an island temple in its middle. Although the Jayatataka is now dry, the island was a substantial 300m square. At its centre is the main pond, 70m square, with four smaller ponds, each 25m square, joined to it at the cardinal points. In the centre of the main pond, a tiny circular island 14m in diameter supports a sanctuary tower. Surrounding these restored parts were another eight ponds, now dry. The path reaches Neak Pean from the N. Walk around the edges of the small northern pond to the main pond. The circular island in the middle is encircled at its base by two naga serpents, their heads on its E side and their tails entwined on the W. They seem to represent the naga kings Nanda and Upananda, linked in Hindu mythology with Lake Anavatapta, and give the monument its modern name, which means “entwined serpents”. The top of the circular steps that form the temple’s platform is ringed by lotus leaves. Another set, inverted, forms the base of the tower. The sanctuary opens to the E, with blind doors on the other three sides. Originally the temple was cruciform with doors on all four sides. Later the doors were closed and elephants were placed at the corners making the temple round. A standing Lokesvara is carved on each of the blind doors. Above the one facing you on the N side, whose head was recently stolen, the pediment shows the ‘Great Departure’. On the E pediment is the cutting of Siddartha’s hair, on the W pediment the Buddha in meditation under the bodhi tree, while that on the S is unrecognizable. The tower itself is ogival and topped with a lotus bud. Location: 50 km northeast of Siem Reap The Siem Reap river (Stung Siem Reap in Khmer), which flows through the main Angkor group and the town of Siem Reap to drain into the Tonle Sap, rises in the western part of the Kulen Mountains north of Banteay Srei. One of its tributaries, the Stung Kbal Spean, flows into it from an outlying hill, the Phnom Kbal Spean. In these upper reaches, it tumbles down the steep hillside, cutting through sandstone strata, and here, just above a fine waterfall, images of the gods have been carved directly into the river bed along a 150-metre stretch that was discovered only in 1968 by Jean Boulbet. Among these are groups of many stubby lingas arranged in rows, and these gave it its Sanskrit name, Sahasralinga, ‘River of a Thousand Lingas’. The fields of lingas are indeed striking, but of greater sculptural interest are the several carvings of Vishnu Reclining in the stream bed. The other two members of the Hindu trinity, Shiva and Brahma, are also represented. Whether the carvings are dry or submerged depends on the water level and so the season, and they are probably at their most evocative at the end of the rainy season, when the fast-flowing water courses around but does not completely submerge the majority. Ever since the first Khmer ruler, Jayavarman II, proclaimed himself emperor ot the world in 802, these hills have been regarded as having deep historical and religious significance. The rock-cut sculptures, some washed by rapids, others submerged in natural pools, and yet others on the rock faces above the water-line, cover a 150m stretch of the river between a natural stone bridge and a waterfall. There are four principal groups, in each case taking advantage of the natural features, which include outcrops, pools and vertical faces. Though unrestored, and in a fairly ruinous state, the large temple of Beng Mealea (‘Lotus Pond’) some 40 km due east of Angkor on the ancient royal way to the ‘great Preah Khan’ of Kompong Svay (another 60 km further on), is one of the major monuments of the classical period, in the style of Angkor Wat and roughly contemporary with it. Whoever built it must have been a figure of some importance, but he remains unknown, as no inscriptions have been found here, and no other that mentions it. Its position was strategic, where the royal way to Koh Ker in the NE forks from the road E to the ‘great Preah Khan’, and also at the head of a canal that leads directly to the Great Lake, down which sandstone blocks from the nearby quarries could have been floated on their way to Angkor. Its chaotic state, with collapsed galleries and towers (the central sanctuary is virtually a pit, with no superstructure whatsoever) may be due to a variety of causes. The most important is simply the wear and tear of eight and a half centuries in a tropical climate, with the spread of vegetation, including the silk-cotton tree and strangler fig, going to work on some ambitious vaulting which was being tried out here and at Angkor Wat for the first time. It is not known whether there was any iconoclasm, a possibility whenever there is evidence of different faiths practiced, as here. Happily, there is no evidence of recent looting. There is a considerable disorder, but very romantic for all that. The temple marked the centre of a town, surrounded by a moat 1025m by 875m, and 45m wide. Four paved avenues lead via cruciform terraces to the entrances at the cardinal points, and it is oriented to the E. Directly to the E of the complex is a large baray, with a small island containing a shrine in its centre, as usual. In plan, Beng Mealea reminds one of Angkor Wat, though all at ground level with no temple mountain. There are three concentric enclosures, each one set back slightly to the west, with the central shrine at the intersection of the axes (and so the intersection of the town’s avenues as well). These enclosures are tied together with ‘cruciform cloisters’, just as at Angkor Wat, and in the NE and SE corners of the enclosures are shrines of the kind known wrongly as ‘libraries’. Also as at Angkor Wat, Beng Mealea has some impressive stone vaulting, and half-vaults that work as a king of buttressing. Prek Toal is one of three biospheres on Tonle Sap Lake, and the establishment of the bird sanctuary makes Prek Toal the most worthwhile and straightforward to visit. It is an ornithologist’s fantasy, with a significant number of rare breeds gathered in one small area, including the huge lesser and greater adjutant storks, the milky stork and the spot-billed pelican. Even the uninitiated will be impressed, as these birds have a huge wingspan and build enormous nests. More memorable than Chong Kneas, but harder to reach, is the village of Kompong Phhluk, an other-worldly place built on soaring stilts. Nearby is a flooded forest, inundated every year when the lake rises to take the Mekong’s overflow. As the lake drops, the petrified trees are revealed. Exploring this area by wooden dugout in the wet season is very atmospheric. The village itself is a friendly place, where most of the houses are built on stilts of about 6m or 7m high, almost bamboo skyscrapers. It looks like it’s straight out of a film set. Phnom Kulen is considered by Khmers to be the most sacred mountain in Cambodia and is a popular place of pilgrimage during weekends and festivals. It played a significant role in the history of the Khmer empire, as it was from here in AD 802 that Jayavarman II proclaimed himself a devaraja (god-king) and announced independence from Java, giving birth to modern-day Cambodia. There is a small wat at the summit of the mountain, which houses a large reclining Buddha carved into the sandstone boulder upon which it is built. Nearby is a large waterfall and above it are smaller bathing areas and a number of carvings in the riverbed, including numerous lingas. The bad news is that a private businessman bulldozed a road up here back in 1999 and charges a US$20 toll per foreign visitor, an ambitious fee compared with what you get for your money at Angkor. None of the toll goes towards preserving the site. The new road winds its way through some spectacular jungle scenery, emerging on the plateau after a 20km ascent. The road eventually splits: the left fork leads to the picnic spot, waterfalls and ruins of a 9th-century temple; the right fork continues over a bridge and some riverbed carvings to the reclining Buddha. This is the focal point of a pilgrimage here for Khmer people, so it is important to take off your shoes and any head covering before climbing the stairs to the sanctuary. The views from the 487m peak are tremendous, as you can see right across the forested plateau. The waterfall is an attractive spot, but could be much more beautiful were it not for all the litter left here by families picnicking at the weekend. Near the top of the waterfall is a jungle-clad temple known as Prasat Krau Romeas, dating from the 9th century. There are plenty of other Angkorian sites on Phnom Kulen, including as many as 20 minor temples around the plateau, the most important of which is Prasat Rong Chen, the first pyramid or temple-mountain to be constructed in the Angkor area. Most impressive of all are the giant stone animals or guardians of the mountain, known as Sra Damrei (Elephant Pond). These are very difficult to get to, with the route passing through mined sections of the mountain (stick to the path!) and the trail impossible in the wet season. The few people who make it, however, are rewarded with a life-sized replica of a stone elephant – a full 4m long and 3m tall – and smaller statues of lions, a frog and a cow. These were constructed on the southern face of the mountain and from here there are spectacular views across the plains below. Getting here requires taking a moto from Wat Preah Ang Thom for about 12km on very rough trails through thick forest before arriving at a sheer rock face. From here it is a 1km walk to the animals through the forest. Don’t try to find it on your own; expect to pay the moto driver about US$20 (with some hard negotiating) and carry plenty of water, as none is available. Before the construction of the private road up Phnom Kulen, visitors had to scale the mountain and then walk across the top of the plateau to the reclining Buddha. This route takes more than two hours and is still an option. About 15km east of the new road, the trail winds its way to a small pagoda called Wat Chou, set into the cliff face from which a tuk chou (spring) emerges. The water is considered holy and Khmers like to bottle it to take home with them. This water source eventually flows into Tonle Sap Lake and is thought to bless the waterways of Cambodia. Phnom Kulen is a huge plateau around 50km from Siem Reap and about 15km from Banteay Srei. To get here on the new toll road, take the well-signposted right fork just before Banteay Srei village and go straight ahead at the crossroads. Just before the road starts to climb the mountain, there is a barrier and it is here that the US$20 charge is levied. It is only possible to go up before 11am and only possible to come down after midday, to avoid vehicles meeting on the narrow road. The temple complex of Banteay Chhmar (admission US$5) was constructed by Cambodia’s most prolific builder, Jayavarman VII (r 1181-1220), on the site of a 9th-century temple. There is debate over its origins, with some scholars suggesting it was built in tribute to Jayavarman VII’s son Indravarman and the Cambodian generals responsible for defeating the Chams, while others propose it was intended as a funerary temple for the king’s grandmother. Originally enclosed by a 9km-long wall, the temple housed one of the largest and most impressive Buddhist monasteries of the Angkorian period. Today, it is one of the few temples to feature the enigmatic, Bayon-style visages of Avalokiteshvara, with their mysterious – and world famous – smiles. On the temple’s east side, a huge bas-relief on a party-toppled wall dramatically depicts naval warfare between the Khmers (on the left) and the Chams (on the right), with the dead – some being devoured by crocodiles – at the bottom. Further south (to the left) are scenes of land warfare with infantry and elephants. There are more martial bas-reliefs along the exterior of the temple’s south walls. The once-grand entry gallery is now a jumble of fallen sandstone blocks, though elsewhere a few intersecting galleries have withstood the ravages of time, as have some almost-hidden 12th-century inscriptions. All the remaining apsaras (nymphs) have been decapitated by looters. Banteay Chhmar was deservedly renowned for its intricate carvings, including scenes of daily life in the Angkorian period similar to those at Bayon. Unique to Banteay Chhmar was a sequence of eight multi-armed Avalokiteshvaras on the outside of the southern section of the temple’s western ramparts, but six of these were hacked out and trucked into Thailand in a brazen act of looting in 1998. Still, the two that remain – one with 22 arms, the other with 32 – are spectacular. There are as many as a dozen smaller temples in the vicinity of Banteay Chhmar, all in a ruinous state. These include Prasat Mebon, Prasat Yeay Choun, Prasat Pranang Ta Sok and Prasat Chiem Trey. At the headquarters of the Banteay Chhmar Protected Landscape (017 971225), 2km towards Sisiphon from town, it may be possible to hire a guide (non-English speaking) for a nature walk. Through Agir Pour le Cambodge, you can participate in traditional activities such as honey collecting and the hunting of frogs and rice-field crabs (US$10 for a group). It may also be possible to visit local silk weavers. A ride out to Banteay Top costs US$5 by ox-cart or US$6 by koyun (tractor). Renting a bicycle costs US$1.50 a day. For almost a decade this was the ultimate Khmer Rouge stronghold: home to Pol Pot, Nuon Chea, Khieu Samphan and Ta Mok, among the most notorious leaders of Democratic Kampuchea. Anlong Veng fell to government forces in April 1998 at the same time as Pol Pot died mysteriously nearby. Soon after, Prime Minister Hun Sen ordered that NH67 be bulldozed through the jungle to ensure that the population didn’t have second thoughts about ending the war. Today Anlong Veng is a poor, dusty town with little going for it except the nearby Choam-Choam Srawngam border crossing, which takes you to a pretty isolated part of Thailand. The average visitor will find little to see or do here, but for those with a keen interest in contemporary Cambodian history its Khmer Rouge sites are an important – if troubling and enigmatic – part of the picture. Anlong Veng’s focal point is the Dove of Peace Monument – a gift of Hun Sen – in the middle of a roundabout. From here, roads lead north to the Choam border crossing, east to Sa Em and Prasat Preah Vihear, and south to Siem Reap (along NH67). There’s nowhere to access the internet. Acleda Bank, the only bank in town, handles travelers cheques. Most of Anlong Veng’s sights are connected with the terrible Khmer Rouge years. To his former supporters, many of whom still reside around Anlong Veng, Ta Mok (Uncle Mok, AKA Brother Number Five) was harsh but fair, a benevolent builder of orphanages and schools, and a leader who kept order in stark contrast to the anarchic atmosphere that prevailed once the government took over. But to most Cambodians, Pol Pot’s military enforcer, responsible for thousands of deaths in successive purges during the terrible years of Democratic Kampuchea, was best known as ‘The Butcher’. Arrested in 1999, he died in July 2006 in a Phnom Penh hospital, awaiting trial for genocide and crimes against humanity. Ta Mok’s home (admission US$2), on a peaceful lakeside site, is a Spartan structure with a bunker in the basement, five childish wall murals downstairs and three more murals upstairs, including a map and an idyllic wildlife scene. About the only furnishings that weren’t looted are the floor tiles – on these very bits of ceramic, the men who killed 1.7 million Cambodians planned offensives, passed death sentences and joked with friends. The trees around the house have been growing quietly since Khmer Rough times, oblivious to the horrific events swirling around them. The swampy lake was created on Ta Mok’s orders but the water killed all the trees, their skeletons a fitting monument to the devastation he and his movement left behind. In the middle of the lake, due east from the house, is a small brick structure – an outhouses, all that remains of Pol Pot’s residence in Anlong Veng. To get to Ta Mok’s house, head north from the Dove of Peace Roundabout for about 2km, turn right and continue 200m past the Tourism Information hut, whose posters promote local curiosities such as ‘Ta Mok’s mango field’. The admission price includes a tour with a knowledgeable English-speaking guide. From the turnoff to Ta Mok’s house, driving a further 7km north takes you to Tumnup Leu, where a right turn and 400m brings you to Ta Mok’s grave. Situated next to a very modest pagoda and the concrete foundations of Ta Mok’s sawmill, it is protected from the elements by a blue roof. The tomb has no name or inscription of any sort but this doesn’t seem to bother the locals who stop by to light incense sticks – and, in a bizarre new local tradition, hope his ghost grants them a winning lottery number. Further north, atop the escarpment of the Dangkrek Mountains, are a number of other key Khmer Rouge sites, each marked with a light blue Ministry of Tourism sigh. For years the world wondered where Pol Pot and his cronies were hiding out – the answer was right here, close enough to Thailand that they could flee across the border if government forces drew nigh. About 2km before the frontier, where the road splits to go around a house-sized boulder, look out for a group of statues – hewn entirely from the surrounding rock by the Khmer Rouge – depicting a woman carrying bundles of bamboo sticks on her head and two uniformed Khmer Rouge soldiers, since decapitated by government forces. Now a macabre place of popular pilgrimage, local people come here to leave offerings of fruit and incense to honour the souls of dead Khmer Rouge soldiers. At the pass (a few hundred metres before the frontier), turn right (east) next to a new, cream-coloured, three-storey building and then, after 50m, hang a left. In front of you, under a rusted corrugated iron roof and surrounded by rows of partly buried glass bottles, is the cremation site of Pol Pot, who was hastily burned in 1998 on a pile of old tyres and rubbish – a fitting end, some say, given the suffering he inflicted on millions of Cambodians. Bizarre as it may sound, Pol Pot is remembered with affection by some locals, and people sometimes stop by to light incense. According to neighbours, every last bone fragment has been snatched from the ashes by visitors in search of good luck charms – Pol Pot, too, is said to give out winning lottery numbers. In 1997 Pol Pot ordered that former Khmer Rouge defence minister Son Sen – who was trying to reach a settlement with the government – and his family be murdered and their bodies run over by trucks. This incident led to Pol Pot’s overthrow and arrest by Ta Mok, followed by his Khmer Rouge show trial (held near the cremation site) and his mysterious death, ostensibly because of a heart attack. A few hundred metres north, next to a ramshackle smugglers’ market, is the old Choam-Choam Srawngam border crossing. A bit to the west, right on the nicely paved main road, the Thais have built a spiffy new crossing, but the Cambodians say it’s on Cambodian territory – yet another Thai land grab. So for now, with no end to the dispute in sight, the old facilities will have to do. From the smuggler’s market, a dirt road heads east between minefields, parallel to the escarpment. After about 4km you come to the overgrown brick walls and cement floor of another Ta Mok residence, shaded by mango, jackfruit and tamarind trees. Nearby is the cement shell of the Khmer Rouge’s radio station and Peuy Ta Mok (Ta Mok’s Cliff), where domestic tourists come to enjoy spectacular views of Cambodia’s northern plains. Some stay at the six-room Khnong Phnom Dankrek Guesthouse (012 444067; r 30,000r), from which a path leads a few hundred metres east, through the Cliffside jungle, to a waterfall (dry except in the west season). In late 2007, this area was being de-mined by the Halo Trust. From here the road continues northeast past minefields, slash-and-burn homesteads and some army bases where soldiers wearing bits and pieces of uniforms sometimes demand that tourists pay bribes. A half-hour moto ride takes you to Khieu Samphan’s house, buried in the jungle on the bank of a stream, from where it’s a few hundred metres along an overgrown road to Pol Pot’s house. Both are marked by signs. Surrounded by a cinderblock wall, the jungle hideout of Brother Number One was comprehensively looted, though you can still see a low brick building whose courtyard hides an underground bunker. Many of the courtyard’s tiles have been carted off, revealing the frozen-in-cement footprints of the trusted Khmer Rouge cadres who built the place. Bot Huddon Guesthouse (Bot Uddom; 011 500507; r US$5-15; Owned by the family of the deputy governor, this establishment – 300m east of the roundabout – has 12 spacious, well-kept rooms with massive hardwood beds. 23 Tola Guesthouse (012 975104; r US$6-15) Built alongside the owners’ family residence, this new place sports hallways tiled in Delft blue and 27 rooms with light-yellow walls. Monorom Guesthouse (012 603339; r US$7-15) Anlong Veng’s finest hostelry, with 20 big, modern rooms; some of the air-con rooms have hot water. Pay when you check in. South of the roundabout there’s a row of food stalls, some with pots you can peer into, others with blazing braziers barbecuing chicken, fish and eggs on skewers. There are fruit and veggie stalls (6am-about 6pm) around Sheang Hai Restaurant. Sheang Hai Restaurant (012 786878; mains 5000-12,000r; 5:30am-9pm or 10pm) Named after the Chinese city of Shanghai (the owner’s nick-name), this all-wood, mess hall-like place serves Chinese and Khmer dishes, including fried rice and tom yam soup. Abandoned to the forests of the north, Koh Ker (admission US$10), capital of the Angkorian empire from AD 928 to AD 944, was long one of Cambodia’s most remote and inaccessible temple complexes. However, this has now changed thanks to recent de-mining and the opening of a new toll road from Dam Dek (via Beng Mealea) that puts Koh Ker (pronounced kah-kei) within day-trip distance of Siem Reap. But to really appreciate the temples – the area has 42 major structures in an area that measures 9km by 4km – it’s necessary to spend the night. Several of the most impressive pieces in the National Museum in Phnom Penh come from Koh Ker, including the huge garuda (mythical half-man, half-bird creature) that greets visitors in the entrance hall and a unique carving depicting a pair or wrestling monkey-kings. Most visitors start at Prasat Krahom (Red Temple), the second-largest structure at Koh Ker, which is named for the red bricks from which it is constructed. Sadly, none of the carved lions for which this temple was once known remain, though there’s still plenty to see – stone archways and galleries lean hither and thither and impressive stone carvings grace lintels, doorposts and slender window columns. A naga-flanked causeway and series of sanctuaries, libraries and gates lead past trees and vegetation-covered ponds. Just west of Prasat Krahom, at the far end of a half-fallen colonnade, are the remains of an impressive statue of Nandin. The principal monument at Koh Ker is Prasat Thom (Prasat Kompeng), a 55m-wide, 40m-high sandstone-faced pyramid with seven tiers that’s just west of Prasat Krahom. This striking structure, which looks like it could almost be a Mayan site somewhere on the Yucatan Peninsula, offers some spectacular views across the forest from its summit. Look out for the giant garuda under the collapsed chamber at the top of the vertigo-inducing stairs. Some 40 inscriptions, dating from 932 to 1010, have been found at Prasat Thom. South of this central group is a 1185m-by-548m baray (reservoir) known as the Rahal. It is fed by Stung Sen, which supplied water to irrigate the land in this arid area. Some of the largest Shiva linga (phallic symbols) in Cambodia can still be seen in four temples about 1km northeast of Prasat Thom. The largest is in Prasat Thneng, and Prasat Leung (Prasat Balang) is similarly well endowed. Other interesting temples: Prasat Bram (Prasat Pram), the first you come to after passing the toll booths (it’ll be on your left), which is named in honour of its five towers, two of which are smothered by strangler figs; Prasat Neang Khmau (Prasat Nean Khmau), a bit further north and on your right, with some fine lintels decorating its otherwise bland exterior; and Prasat Chen (Prasat Chhin), about halfway from the toll booths to Prasat Krahom, where the statue of the wrestling monkeys was discovered. The most dramatically situated of all the Angkorian monuments, 800m-long Prasat Preah Vihear (elevation 730m; admission 10,000r) perches high atop the south-facing cliff face of the Dangkrek Mountains. The views are breathtaking: lowland Cambodia 550m below, stretching as far as the eye can see, with the holy mountain of Phnom Kulen looming in the distance. Prasat Preah Vihear, an important place of pilgrimage during the Angkorian period, was built by a succession of seven Khmer monarchs, beginning with Yasovarman I (r 889-910) and ending with Suryavarman II (r 1112-1152), builder of Angkor Wat. Like other temple-mountains from this period, it was designed to represent Mt Meru and was dedicated to the Hindu deity Shiva. Start a visit at the monumental stairway, if possible from the bottom (near the market and the crossing from Thailand). As you walk south, you come to four cruciform gopuras (sanctuaries), decorated with a profusion of exquisite carvings and separated by esplanades up to 350m long. At the entrance to the Gopura of the Third Level, look for an early rendition of the Churning of the Ocean of Milk, a theme later depicted awesomely at Angkor Wat. The Central Sanctuary and its associated structures and galleries, in a remarkably good state of repair, are right at the edge of the cliff, which affords stupendous views of Cambodia’s northern plains – this is a fantastic spot for a picnic. For more on the carvings of Prasat Preah Vihear and the temple’s history, look out for market vendors selling Preah Vihear by Vittorio Roveda, a readable souvenir book accompanied by some attractive photographs. With their many thousands of Hindu devotional structures, from the state temples of Angkor down to the smallest village shrines, and with its huge Mahayana Buddhist complexes and attendant monks, Cambodia’s cities and countryside must have been bustling with religious activity. It is true that Theravada Buddhism had become strong by the time of Zhou’s visit, but the other two religious traditions continued to play important roles. Brahmanic Hinduism had been all-pervasive during most of the Classic period, until temporarily (and only partially) eclipsed by Jayavarman VII’s Mahayanism. Hinduism is not a congregational religion such as Buddhism or Christianity, but is centred on individual devotion and worship of a god or goddess in a ritual that was always under the care of Brahmin priest. The temple or shrine was there to provide a house in which the deity could take up temporary residence; there he (or she) would have a place to eat, to be bathed, and even to sleep. If everything was well conducted, the god would then come to life in his/her own stone, wood or metal image. Devotion was a two-way, supernatural contract. To the god the devotee gave offerings of flowers, incense, fruit, clarified butter, coconut juice and the like; in return, the devotee received back from the deity the now-blessed offering (prasad), along with the spiritual well-being (darshan) that resulted from eye contact with the now-live image. In this sense, each of the thousands of Classic Cambodian sculptures of the gods to be seen in museums, in collections, and in the Angkor conservation facility had once resided in a darkened shrine or sanctum at the centre of a temple establishment, and had been worshipped according to established Brahmanic practice. The Khmer worshipper, alone or in a group, would have come to the temple with the appropriate offerings, and moved in a set way from the decorated outer structures of the complex towards the central shrine where the god lived, proceeding around the sacred space in an ever-decreasing, clockwise direction (this is pradakshina, the auspicious direction). As he neared the sanctum, he passed through structures outside of it in which were halls where the god was taken for his washing, sleeping or entertainment by dancers and musicians. The sanctum itself was dark and undecorated, and entrance was only allowed to the Brahmin officiant, who acted as an intermediary between the devotee and the deity. The priest took the offering, and in turn offered it to the god, anointing it with the liquid oblations, and decorating the image with garlands. After the image was censed, the priest passed a lamp before it, which was then brought to the worshippers so that they could pass their hands quickly through the flames. Finally, with hands raised and folded palm to palm, the devotee established eye contact with the god, and was granted darshan. We may be sure that for the wealthy, and for the ruler and members of the royal family, temple rituals were splendid affairs, with orchestral music, large troupes of temple dancers and temple elephants in procession. But even the king had to prostrate himself humbly before the gods, as Bayon relief scenes of Jayavarman VII worshipping at shrines of the gods Vishnu and Shiva prove. One can now understand why Cambodian artists and architects placed sandstone lintels elaborately carved with garlands and vegetation over temple doors – portals that were guarded by divine youths (dvarapalas) and lovely maidens (devatas): it was to make a beautiful home in which a deity might be happy to reside. On entering a temple, Buddhists, be they Mahayanist or Theravada (as many were by the end of the thirteenth century), paid devotion to the ‘Three Jewels’ or ‘Three Refuges’: 1) the Buddha, represented by an image, a stupa (burial monument), or a bodhi tree, the tree under which the Founder reached Enlightenment; 2) the Dhamma or Dharma, Buddha’s teaching, represented by a sermon or informal teaching by the monks; and 3) the Sangha, the community of monks. The devotee showed reverence before the sacred objects by bowing three times while standing or kneeling with the palms joined. As with Hindu devotion, offerings, accompanied by chanted verses, were made to the images, and usually consisted of flowers, incense, and sometimes a ritual scarf. In Mahayanist practice, the offerings were quite elaborate, with seven different oblations, each in its own bowl. Mahayana Buddhists, who included Jayavarman VII, paid special homage to images of Avalokiteshvara, the Bodhisattva of infinite compassion and mercy; in this branch of Buddhism, images were imbued with the spirit and power of the being they represented, but for the more austere Theravadists, they were merely reminders of Buddha’s life and message. Regardless, all images had to be consecrated before they could fulfil their function, whether in a temple like the Bayon or in a pagoda. There seems never to have been a time in Cambodia’s history when Khmers were not fighting each other, or waging war on foreign enemies. For the Classic Khmer period, while Zhou Daguan and the inscribed monuments have little to say on the subject, there is abundant pictorial information on armaments, order of battle and actual warfare in the reliefs of Angkor Wat, the Bayon and Banteay Chhmar. Even the Buddha’s message of peace and his prohibition on the taking of life did not deter Jayavarman VII from glorifying what seems to have been his great and bloody defeat of the Cham invaders in gruesome detail. The ordinary Khmer soldiers as well as officers might carry a lance; or a bow, with the arrows being held in a quiver; or sabers of different length; or various sizes of knives and daggers; or a kind of halberd known as a phka’k. The latter was basically an iron axe mounted on a long handle curved at one end. At Angkor Wat, the phka’k is held in the hands of high-ranking warriors mounted on elephants or horses; it was still in use in the twentieth century for hunting and work in the forest. Crossbows were known, but are extremely rare in the reliefs. For personal defence, there were two kinds of shields: round ones ornamented with vegetal or flower motifs, and long ones ornamented on the top border. The latter could be grouped together to form a kind of rampart. Both were probably of wood and hide, with metal plaques. Although most warriors wore only a kind of short-sleeved jacket (sometimes resembling the quilted cotton ‘armour’ in use in Mesoamerica), many were protected by a cylindrical cuirass, often with one or two knives lashed over it for close combat. Far more sophisticated armament is to be seen on the Bayon and at Banteay Chhmar, especially among the infantry. This includes a ballista, mounted either on elephant back or on a wheeled vehicle that could be rolled onto the field of battle; it consisted of two opposed bows, worked by two men, and shot arrows with tremendous force. Michel Jacq-Hergoualc’h, the leading authority on Khmer warfare, believes it may be of Chinese origin. Shield ‘ramparts’ mounted on wheels are another innovation of Jayavarman VII’s reign. A combat unit consisted of foot soldiers, three to four mounted cavalrymen, and one war elephant. Elephants were reserved for the king and for his highest officers; these stood on roofless, decorated howdahs, with a mahout placed in front to direct the elephant, and wielded various kinds of weapons – the lance-and-shield, the phka’k , or the bow-and-arrow. Cavalry horses were ridden without saddle or stirrups, and during combat the mounted knights often stood on their steeds’ backs. In the great procession depicted at Angkor Wat, the riders (and some infantrymen) were distinguished by headgear in the shape of eagle or deer heads. War chariots were very similar to naga-decorated carts, but were roofless, and drawn by pairs of horses. Some sections of the Khmer army consisted of foreign mercenaries, such as the colorful Siamese (Thai) unit depicted in the South Gallery relief of Angkor Wat, with their beaded, wig-like headgear and beaded jackets and skirts; these were led by a Thai general mounted on an elephant. Even traditional enemies like the Cham (recognizable from their flower-like headdress) or the Vietnamese could be recruited into the military service of the Angkor state. The Khmer army on the march must have been an impressive sight – and sound. It was accompanied by military music produced by a huge gong struck by a dwarfish person, long trumpets, bronze castanets, and blasts from conch shells. The ark of Sacred Fire, under the care of Brahmin priest, was carried along into battle, and there were parasols, banners and battle standards. The latter consisted of a staff mounted with the small bronze figure of one of the monkey generals from the Ramayana, or of Vishnu mounted on Garuda, or of Garuda by himself. Supplies and food for the army were brought in covered wagons drawn by bullocks, and even on pack elephants, while pigs were driven along the route of March. There were many camp-followers, perhaps the wives and children of the soldiers. Women of far higher rank traveled with the army in palanquins, rickshaws and sedan chairs. Great naval battles with the Cham appear on the Bayon and at Banteay Chhmar, both sides employing essentially identical ships embellished with garudas on the prow and nagas on the stern. Each vessel had 20 to 42 rowers plus a steersman, and must have been enormous. These bloody engagements on the waters of the Great Lake included the use of grappling hooks. The Brahmins who brought Indic culture and learning to the royal courts of mainland Southeast Asia during the early centuries of our era continued to play that role throughout the Classic period, and in the royal palaces of Cambodia and Thailand, right into modern times. These intellectuals acted as priests of the temples, teachers, royal chaplains, librarians, astrologers, and in all likelihood architects and calligraphers. It was they who cast the horoscopes for all important events, who interpreted the Vedas and the Hindu laws to the empire’s power brokers, who designed temples in which the great gods could reside, who conducted all ritual, who tended and carried the Sacred Fire, and who kept the calendars. These inscriptions were placed under the gaze of a particular god and seemingly were intended to attract that deity’s attention to the person who had had the sanctuary built in his honor or, more often, who was offering him gifts. Most of these donors were kings, the poems being composed upon their death. They were accompanied by a short eulogy (prashasti). Prose texts in Old Khmer comprised the other kind of inscription, frequently appearing on the same stone with the Sanskrit one; these had a very different, more prosaic, and far more informative subject matter. According to Jacques, the overwhelming majority are inventories listing the temple’s possessions – land, livestock, servants and furnishings. Some end with an imprecation formula, for example putting a curse upon any violator of the terms of the grant ‘as long as the moon and the sun shall last’. These texts are generally fixed in time by the intricate calendar system of ancient Cambodia, itself partly dependent upon astronomical and astrological considerations. The solar year is given in terms of the Great Era (saka) that began on the Vernal Equinox of AD 79; thus, one is to add 78 to the saka date to reach a year in our system. The digits making up the saka numbers may be spelled out alphabetically, or they may be given by chronograms: for example, saka 1044 (AD 1122) might be given symbolically by ‘oceans , ‘oceans’ (again), ‘sky’ [o], ‘moon’ . There were 12 lunar months, each divided into a 15-day waxing period and a 15-day waning one. The astrologers were deeply interested in the current position of the moon against the band of stars that runs along the ecliptic in a kind of lunar zodiac; since the sidereal month is about 27 days, there were 27 of these ‘lunar mansions’ or nakshatras, each with an animal name (the moon generally traversing one mansion a day). Because the lunar calendar was always running ahead of the solar one, extra lunar months were occasionally intercalated in a complex system of Indian origin. By Zhou Daguan’s day, solar years were also expressed in terms of a 12-year cycle, each year named for a specific animal, a system that they had borrowed from the Chinese – perhaps a reflection of Cambodian’s rapidly increasing trade with the Middle Kingdom. Like their counterparts in peninsular India, the Cambodian astrologers were close observers and calculators of the positions of the five visible planets (Mercury, Venus, Mars, Jupiter and Saturn) as these moved across the solar zodiac, which was essentially the same one that is still in use in the Western world. One more calendrical statement appearing in the inscriptions is the day of the seven-day week, each day being linked to one of the planets or to the sun or to the moon, as it is with us. According to Zhou, the ordinary Khmer had no family or personal names, but were known by the day of the week on which they were born. 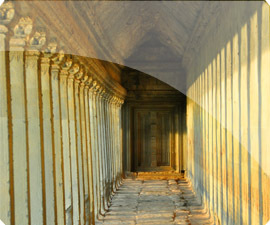 The Yugas – the huge cosmic cycle of successive creations and destructions – did not enter into their calendrical computations, but they certainly played a role in Cambodian cosmology, as Eleanor Morón Mannikka has shown in her study of the proportions and measurements of Angkor Wat. It is likely that all secular books were paper screenfolds. Such accordionlike manuscripts were being produced in Cambodia until the middle of the twentieth century. The paper was manufactured from the inner bark of a member of the mulberry family; it was softened by soaking, then wrung out and finely shredded to separate the white from the brown fibres (these latter being used to produce black paper, the kind mentioned by Zhou). After this had been boiled with white lime and then washed and pounded, the resulting paste was spread onto cloth or screens and left to dry in sheets. White paper was treated with rice powder mixed with water and chalk, and black paper with soot or charcoal. The final stage was to polish the surfaces, and fold the paper into books. Manufactured paper was imported from China; while there is no mention of its use to make books, Zhou reports that the natives derived great amusement at seeing the Chinese use it as toilet paper. Zhou describes the chalk pencils that were used to write black pages, and says that such pages could be easily erased; accordingly, official documents, such as revenue, corvée manpower and census tallies must have been kept in the white-paged screenfolds, which were written in black ink, probably with bamboo and/or metal pens. Assuredly some of these paper books contained astronomical tables, for Zhou assures us that their astronomers could calculate solar and lunar eclipses – an impossibility without the accurate accumulation of observational data over a very long period of time. How literate were the Classic Khmer? Surely all the Brahmins of the empire could read and write, and so could the kings and princes, all of whom had been instructed by Brahmin teachers (in contrast to contemporary European rulers such as Charlemagne, who were often illiterate). The vast civil bureaucracy would have found it in their interest as revenue gatherers and beneficiaries to be literate, too. Both Mahayanist and Theravada Buddhist monks would by Sangha rules have to be able to read and recite the sacred texts of their faith. Add to this list the masters of works, the architects, and the master craftsmen who worked in stone and metal, and one can conclude that a substantial minority during Classic times was lettered. Nonetheless, the great majority of Khmer – the free peasants and the slaves – would have been unable to ‘read’ anything but the imagery of the reliefs and sculptures. There were many cities during pre-modern times in both mainland and insular Southeast Asia. Following a dichotomy first recognized for medieval France, John Miksic of the University of Singapore has proposed that they fell into two groups. Heterogenetic cities were found along coastlines and at the borders of ecological zones rather than at their centres; they had few public monuments, and were characterized by entrepreneurship and intensive trade, as well as by high population densities (pro-colonial Malacca would have been an excellent example of such a city). Orthogenetic cities were located well inland, and were correlated with the production of a surplus staple crop – that is, rice – which could be commandeered by the authorities. Stability and ritual were the prevailing order, and there were impressive monuments of a religious nature. There was no money and little evidence for large markets and significant trade. ‘The permanent population of the orthogenetic city was composed of nobles, civil, religious and military bureaucrats, and their staff.’ In contrast with heterogenetic cities, overall population density was very low. From everything that we know about Angkor, it would appear to have been orthogenetic. Moving away from our area, so would have been the monumental Classic Maya cities such as Tikal, Copan and Palenque in Mesoamerica, with their royal courts and extremely dispersed patterns of settlement. The Streets of the walled Town are many of them large, straight and regular, with channels running through them, although the most part of small narrow Lanes, Ditches, and Creeks most confusedly placed; the Citizens have an incredible number of small boats…which come to their very doors, especially at floods and high water. The houses of ordinary inhabitants were thatched, single-storey structures of bamboo and wood, built on piles, while foreign traders lived along the main north-south avenue in more substantial tile-roofed houses. Ayutthaya, whatever its Angkor-inspired beginnings, was slowly evolving from an orthogenetic to a partly heterogenetic city, due to the easy access that Chinese, European and Arab traders had from its waterways. Let us first consider Angkor Thom; in recent years its four quadrants have been surveyed in detail by Jacques Gaucher of the EFEO, using aerial photographs and ground ‘truthing’. The main axes of Angkor’s capital district were lined with canals, and, again like Ayutthaya, the Royal Palace was in the northwest quadrant; elsewhere, apart from the monumental constructions, there were numerous small water tanks, channels, and house mounds. Based on the results of this survey, Roland Fletcher suggests that while Angkor Thom could have held as many as 90,000 people (assuming a density of 100 persons per hectare), the population may have been only a quarter of that, given the amount of open space (as in Ayutthaya); the palace; the major temples; and the single-story dwellings. Turning now to the city of Angkor as a whole, a survey carried out there from 1992 to 1998 by Christophe Pottier has shown that this landscape was dotted with low mounds that had once supported hamlets of about five to ten traditional, single-storey houses. These mounds were associated with hundreds of small, local shrines and medium-sized, rectangular water tanks, recalling Zhou Daguan’s statement that ‘every family has a pond – or, at times, several families own one in common’. Based on ground survey and upon radar imagery and aerial photography, Fletcher now estimates that the total area of Angkor’s urban complex is about 1,000 square km (386 square miles), within which the people were mainly living along linear features – canals and roads that extend out from central Angkor for about 20 to 30 km (12 to 18 miles) in all directions, probably less and less densely occupied as one moves towards the peripheries. Angkor Thom, then, was like a kind of spider sitting in the centre of a virtual web of settlement, with large open spaces, including even rice fields, between the ‘threads’. This web extended well north of Preah Khan into the foothills of Phnom Kulen; the lovely Banteay Srei was probably at its northern edge. In Fletcher’s words, ‘Angkor was therefore a low density, dispersed urban complex with housing along linear features and scattered across the landscape in patches and on isolated mounds.’ Groslier’s estimate of 1.9 million persons is thus an impossibility. The true figure for Angkor at its apogee, during the reign of Jayavarman VII, was probably a fraction of this, but only a great deal of future research can give us an idea of the total population. The system of government that made Classic Khmer civilization and the city of Angkor possible was a highly effective and powerful ‘top down’ one, supported by a command economy and by a massive and all-encompassing, revenue-generating bureaucracy operating on every level from palace to village. Historian David Chandler has summarized this kind of government in both Cambodia of the 1860s, and Cambodia under the rule of Angkor. In both cases…government meant a network of status relationships whereby peasants paid in rice, forest products, or labour to support their officials. The officials, in turn, paid the king, using some of the rice, forest products, and peasant labour with which they had been paid. The number of peasants one could exploit in this way depended on the position one was granted by the throne; positions themselves were for sale, and this tended to limit the officeholders to members of the elite with enough money [absent, of course, in Classic times] or goods on hand to purchase their positions. Angkor is not Angkor Wat, Really? Yes, Absolutely! If people say Angkor, it refered to the whole city - Group of Temples including Angkor Wat. If people say Angkor Wat, It's about the 1 temple in Angkor City that many people come to Cambodia to see it. The Angkor Wat Entrance is on the West, not East. Sunrise over Angkor Wat is really really wonderful and you feel like you are standing on the top of stone in the God City.